Burt “Skip” Cleveland, aka the Birdman, was walking up to the 135th turkey he shot before realizing his mistake. Lying on the ground was a hen. He surmised that she came over the crest when the group of gobblers he had called into range started to move away. As they passed behind a tree, she was the first to appear on the other side, where he aimed. Needless to say, the hard-core turkey hunter from Troy, Pa., was not pleased. He grudgingly went to pick up the turkey, which he described as the old flock hen. Maybe a touch too aggressively, he put his hand around a leg. Ouch! What he found stunned him and began an inquiry that would give him a world record from the National Wild Turkey Federation. Cleveland conducted an internet search but everything he found said hens don’t have spurs. He knew different, “because I have one.” But he found somewhere to turn to: the National Wild Turkey Federation. Enter Phil Ferrare, the NWTF Regional Director, who wanted to be certain it was a hen before agreeing to drive more than 4 hours to meet Cleveland and document the bird. “Of course, he asked me, are you sure it’s a hen?” Cleveland said a touch incredously. “I am experienced turkey hunter. I know what a hen looks like. Ferrare ended up being a tremendous help, Cleveland said, explaining the process, getting all the measurements and sending it on to biologists at the NWTF headquarters in Edgefield, S.C.
Cleveland said the biologist there, who also had to verify that it was in fact truly a hen genetically, had handled 30,000 turkeys and had never come across a hen with spurs. Through emails and phone calls with the NWTF, Cleveland began to realize his spurred hen was really special. The approved documentation made it to Karen Cavender, the NWTF record coordinator. She compiles the database of birds that allow hunters to see how their registered birds rank in weight, beard and spur length nationally and by state. 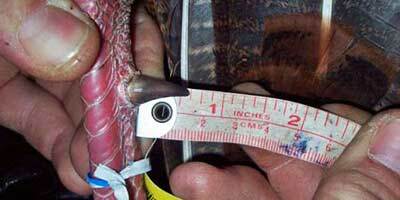 The NWTF has 17,000 birds in its records, but since 1982 there have been only 181 hens registered. Cleveland received a certificate, a pin and plaques acknowledging his world record for longest spurs on a hen. With 135 kills, he’s spent a lifetime pursuing perhaps North America’s wiliest creature. He was a quick study. Cleveland has accumulated his totals for the most part in his home state and New York, getting two birds in each spring and fall season. He called in all his birds hunting mostly on public land and said he would never use a decoy. Teaming with cousin Gary Gee of Ridgeberry, Pa., the two total about 250 birds, including the National Wild Turkey Federation Grand Slam of the four birds in America, Osceola, Eastern, Merriam’s and Rio Grande. Cleveland’s house is overflowing with memorabilia, including 10 full mounts, 20 feet of beard boards, a shelf with 14 sets of feet and five fish stringers of spurs. He also has kept every one of his turkey tags since 1980. “They tell me I have one of the nicest turkey displays in this area,” he said, adding that his 1994 dark blue pickup has 135 turkey track decals as pinstripping, one for each of his kills. He’s hunted in seven different states and said he has set a goal, albeit on a handyman’s budget, to shoot a turkey in all the states that have them. His latest claim to fame, the NWTF world record for the hen with the longest spurs, was sent to taxidermist John Houlk in New York for a world class habitat mount.